Good idea, and good luck! I don’t think I’m really afraid of the actual sewing, I’m just afraid of taking on more than I’ve got time to do – I don’t want my sewing to get bogged down in trying to sew jeans, for example, when I could just buy some and sew something for fun instead… But then that’s not really the point is it? I can never find jeans that fit anyway, and I’m thinking about seamless pledging… so, um, I’m not sure what my point is actually 🙂 I do know that I’ve learned the most and the best things from sewing when I’ve bitten off more than I can chew. Nothing like stubborn determination to get some new seamstress skills learned! I know exactly what you mean! Basically, I think: “Oh, I’ll never have time to do that!” And I think most of the things in here will take me ages, but like you said, I’ll probably just slip back into bad shopping habits again. The pledge is fun, honest! Bras, jeans and corsets would be mine! I’m also really afraid of sewing anything with sheer fabric! I made a long-sleeved shirt last year, it was such a disaster that I’m buying a rather nice, floral one now! Never again! I have tried so hard to do the seamless pledge and have only purchased probably 4 items of clothes since January as I don’t know how to sew them. For me it is the fitting that I have problem with, not so much the sewing. I get to a problem and then don’t know how to fix it.. so I have quite a few WIP’s . Trousers or anything with legs would be my biggest challenge.. Wouldn’t know where to start. I really need to learn as I struggle getting jeans etc to fit me. Big bum small waist… pear! 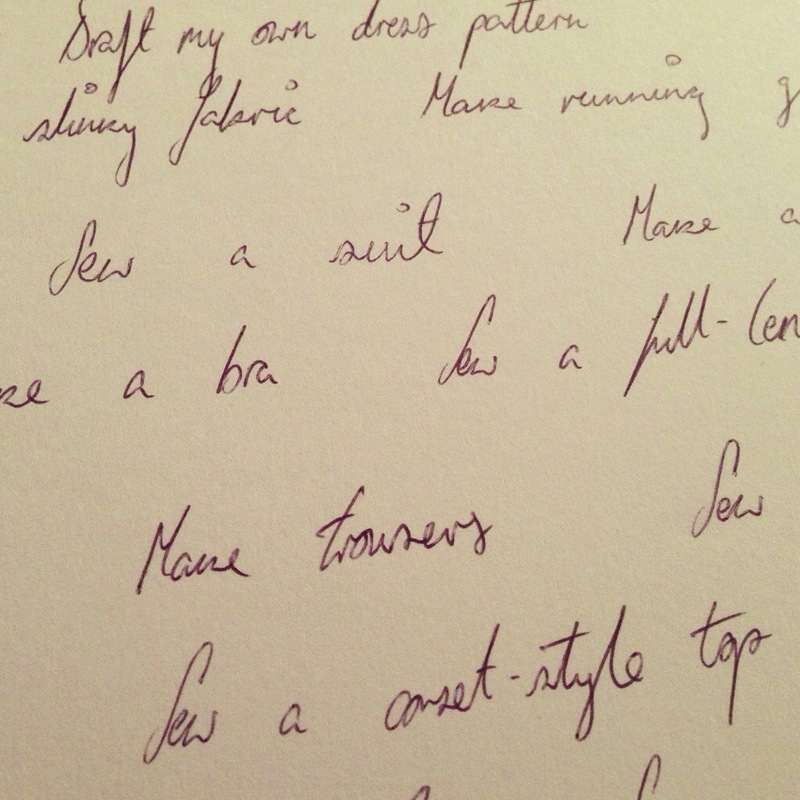 Craftsy sewing with knits opened up work out concepts for me! Conquered the button hole, and invisible zipper. Afraid of jeans, lapped zippers, bras & jackets. Ive stuck to the pledge since May but longingly I look online at clothes and think it would so easy to use the ‘add to cart’ button. My local sewing store has a bra class but they want $225 for the registartion – which is SO outta my price range! 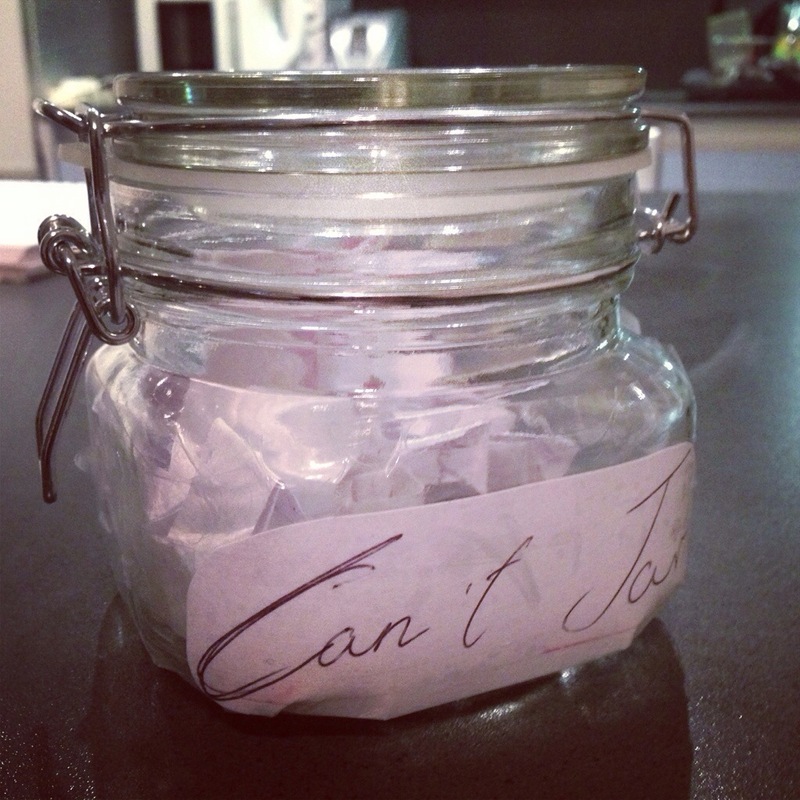 I like your new I cant jar. What a great idea! I’m forcing myself to attempt to sew some things this year I thought I couldn’t. Can’t wait to see your journey. Very most definitely bras (and sports bras). Honestly, I don’t even feel like sewing them. Skisuit might be another one. But then, I don’t live in arms reach of the Alps (or Rockies) anymore. I try to choose not only a pattern I want but a technique I’ve never done before, even if the pattern doesn’t call for it. I was terrified of French seams until I tried 4 weeks ago……now everything possible has them lol. I think I’m going to list all the things I “can’t” do, and try them out! First on the list is button holes! Ooh, fabulous idea! My biggest can’t (but want to) is bras. They’re feats of engineering when bought, can I actually recreate that? Particularly as my bra size is practically a post code! I also run scared from trousers that aren’t PJs and a proper wool coat. I have the Lady Grey in my pattern collection and want to do it properly with pad stitching etc following Gertie’s sewalong. Good luck with your challenge! I’ve also broken my pledge recently to restock my knitwear as I was in desperate need and drawing a blank in the charity shops. It felt really strange though and it wasn’t Primarni! Great idea. I can sew a lot however I still have fitting issue with pants. It is difficult to fit it on yourself. Even copying old ones did not help. So on my list trousers!